How/Where can I learn to read this annoying formatting? Edit: I cannot directly seem to copy/paste them in either or know how to make the weird symbols. Please view the link below. And like, how/where can I learn to read this very much hard-to-read code and turn it into actual mathematics that I can either write on paper or use for java code? So yeah, what does that mean? I get the square root thingy, but what is with the A and the tiny x thing, and whats with the two as well? A big A with a tiny 2 and an x by it? What is that meant to mean? As I say, the above is only an example (You can find it here - How to calculate the 'rotation' between 2 coordinates? ), and I keep having this problem time and time over again on this site. The problem being, I have a brilliant answer, but have absolutely zero idea how to actually even read it! So how/where can I learn to read this stuff? $a_x$ is the name of a number, specifically the first component (the $x$-coordinate) of the vector $\vec a$. The little $_x$ is part of the name, and has no real mathematical significance. The little $^2$ means it's raised to the second power, in other words that it's multiplied with itself. As for how to make it look the way it does, any math on this site is (or should be) enclosed within dollar signs, so $1+1=2$ becomes $1+1=2$. If you're wondering how to do more fancy stuff there are three ways to find out more. One is to google "latex math commands" or something to that effect. The second one is to use other's post for what they're worth. Any mathed text can be right clicked, press "Show math as TeX-commands" and see exactly what the author wrote to make it look like it does. The edit link also lets you see the source code. How can I find what questions SO closes? Do we want to encourage using this site as a place to learn broad concepts? 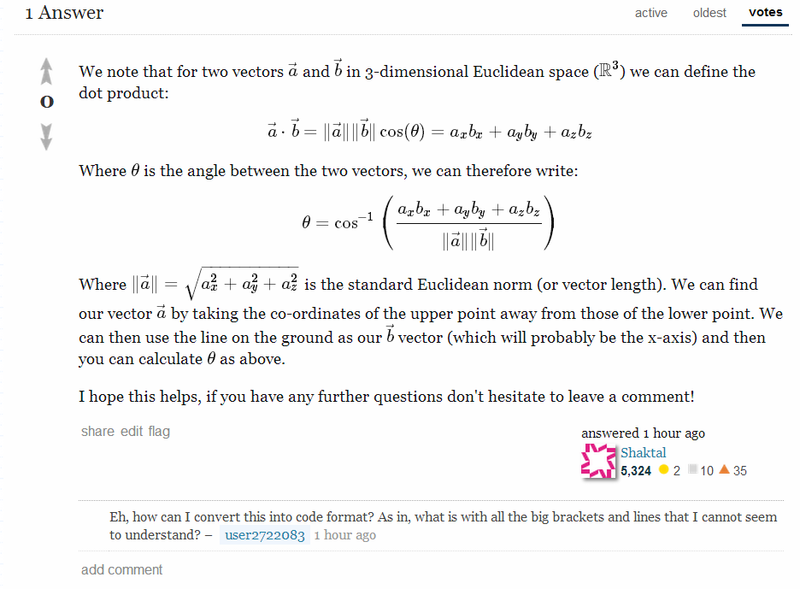 I would like to ask about how do certain calculations for example Wolfram Alpha, are there general guidelines?